Activists Shane Claiborne and Jonathan Wilson-Hartgrove show how prayer and action must go together. Their exposition of key Bible passages provides concrete examples of how a life of prayer fuels social engagement and the work of justice. Phrases like "give us this day our daily bread" and "forgive us our debts as we forgive our debtors" take on new meaning when applied to feeding the hungry or advocating for international debt relief. 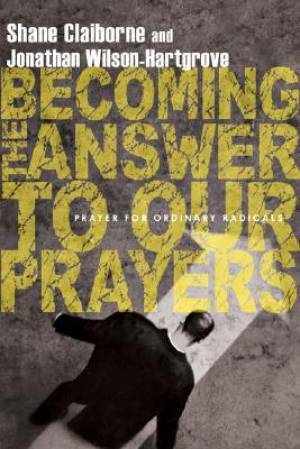 If you hope to see God change society, you must be an ordinary radical who prays-and then is ready to become the answer to your own prayers. Becoming the Answer to Our Prayers by Shane Claiborne; Jonathan Wilson-Hartgrove was published by Intervarsity Press in September 2008 and is our 27886th best seller. The ISBN for Becoming the Answer to Our Prayers is 9780830836222. Be the first to review Becoming the Answer to Our Prayers! Got a question? No problem! Just click here to ask us about Becoming the Answer to Our Prayers.